A few weeks ago, in an article about the B-17 Lead Banana, I published a poem about that Flying Fortress by Lawrence Vallo, radio operator of the Paul Norton crew of the 384th Bomb Group. Vallo was a Native American airman and you can read much more about him in that previous post. I immediately recognized the Vallo name when I read the poem and that got me to thinking about some Norton crew photos I had in my collection. There is a connection between the Paul Norton crew and the John Buslee crew of which my dad, George Edwin Farrar, was the waist gunner. The Buslee crew arrived at their air base in Grafton Underwood, England about seven weeks after the Norton crew. 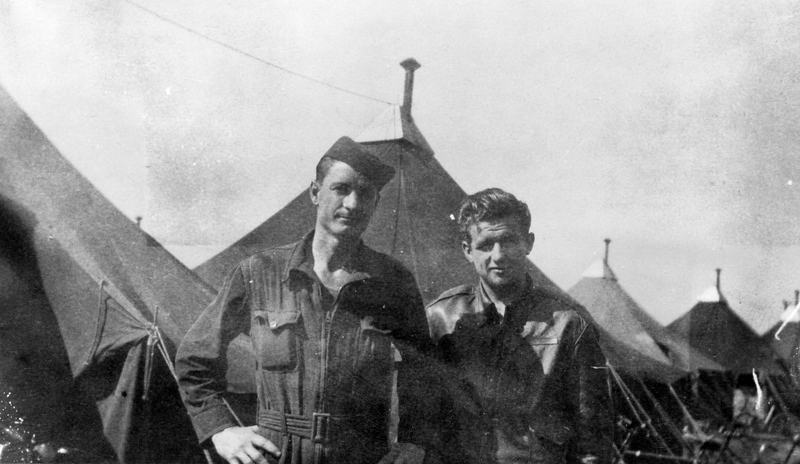 They were both part of the 544th Bomb Squadron and therefore lived in the same area of the airbase. 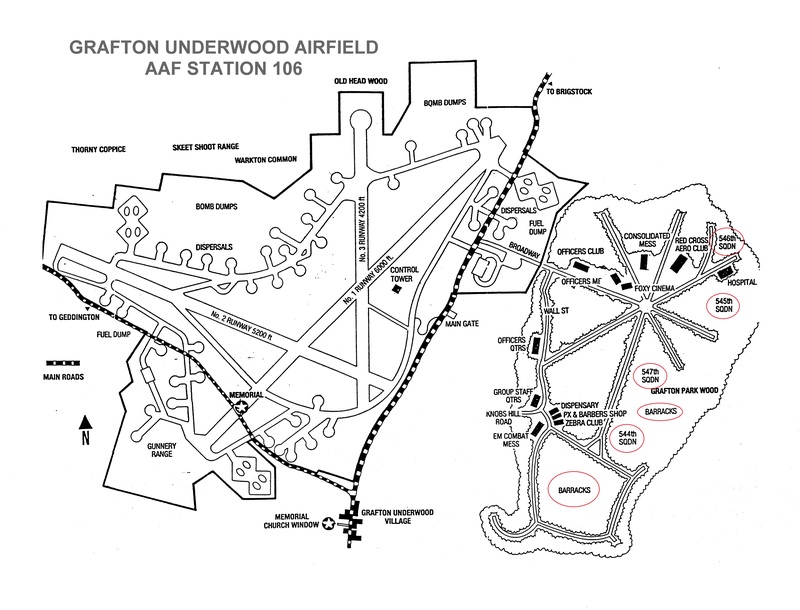 Note the circled 544th SQDN in the bottom right corner of the map of the Grafton Underwood airbase. I speculate that the enlisted men of the Buslee crew may have even shared living quarters with the enlisted men of the Norton crew. Among my dad’s photos from Grafton Underwood are several of the enlisted men of the Norton crew, which I share below with further descriptions. I believe all of these casual photos may have been taken in the same time period as this one of my dad and some of his Buslee enlisted crewmates. 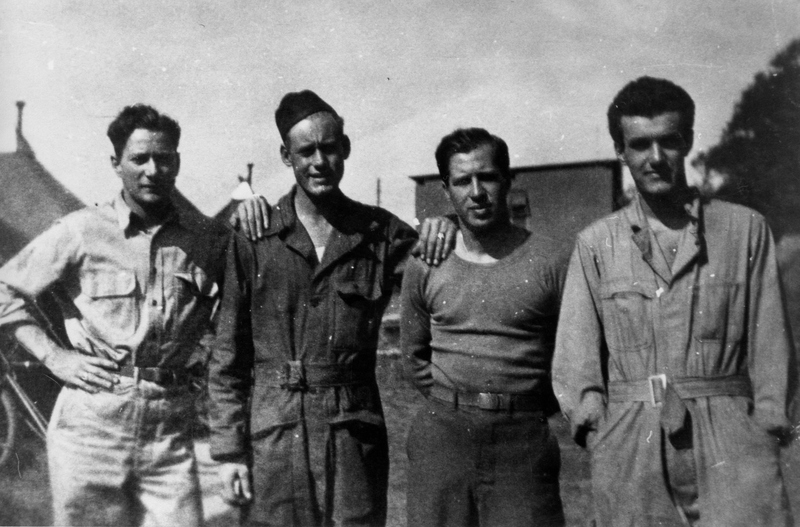 Buslee crewmates left to right: George Edwin Farrar (waist gunner), Lenard Leroy Bryant (top turret gunner), Erwin V. Foster (ball turret gunner), and Sebastiano Joseph Peluso (radio operator). In the background (left) are tents, and (right) a latrine. 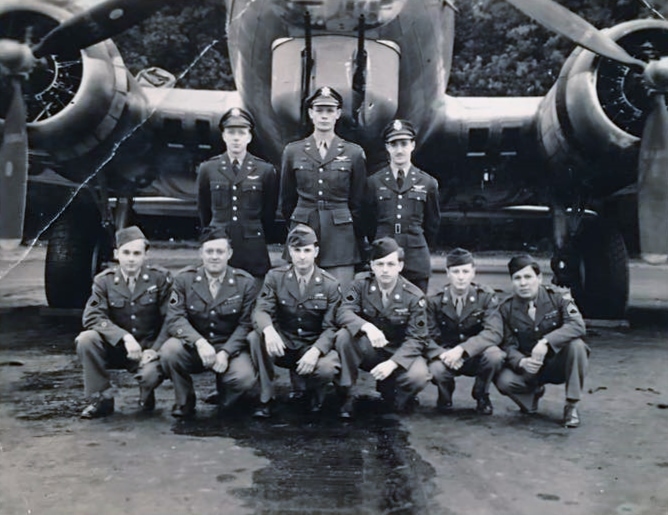 The Buslee crew’s first mission with the 384th Bomb Group was on August 4, 1944. It was a training mission for crew pilot John Buslee. With Buslee in the co-pilot seat and Arthur Shwery showing him the ropes, that didn’t leave a spot in the cockpit for Buslee’s co-pilot David Albrecht. So Albrecht got in some training himself flying as co-pilot with the Paul Norton crew. I think the photo (above) is of the Buslee crew’s David Albrecht on the left and the Norton crew’s Carl Guinn on the right. Carl was the Norton crew’s engineer/top turret gunner and his position in the aircraft was directly behind the pilot’s compartment. The engineer interacted with and assisted the pilot and co-pilot and was in charge of interpreting the instrument readings during flight. A good engineer knew what the combination of instrument readings meant as far as condition of the engines, etc. I believe the photo, and most of the others included here, were taken after the completion of the August 4, 1944 mission. The next photo will explain why. Notice the flight jacket in the above photo. The man holding it was Norton crew waist gunner turned togglier Clarence Bigley. Bigley decorated the back of his jacket with the crew’s nickname Frigham Young and twenty bombs. I don’t believe it was coincidence that the August 4, 1944 mission was Bigley’s twentieth. 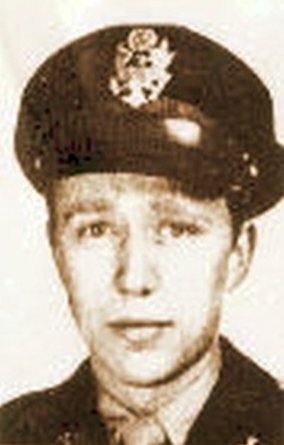 As for the name Frigham Young, it was a play on words on the name of Mormon leader Brigham Young as the crew’s commander, pilot Paul Norton, was reportedly a Mormon. Also appearing in the above photo are Norton crew tail gunner John Bregant, engineer/top turret gunner Carl Guinn, and ball turret gunner Lester Noble. In the crew photo of the entire Norton crew, I cannot identify Bregant. However, I have managed to find a few school yearbook photos of him, and his thick mass of hair gives him away. I am quite certain that it is Bregant in the above photo. 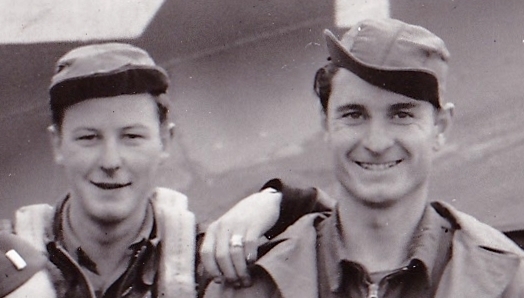 The man standing on the right in the above flight jacket photo has Les painted on the front of his flight jacket. He must be Norton crew ball turret gunner Lester Noble. All four of these men of the Paul Norton crew were on the August 4, 1944 initiation flight of Buslee co-pilot David Albrecht aboard the B-17 Little Kenny. The poet of the crew, Lawrence Vallo, was aboard, too, and so was Thomas Everitt, the Norton crew’s waist gunner. who later wrote a book, Tales of a Pueblo Boy, about his life growing up in an Indian Pueblo, which can still be found on used book sites and Amazon.com. 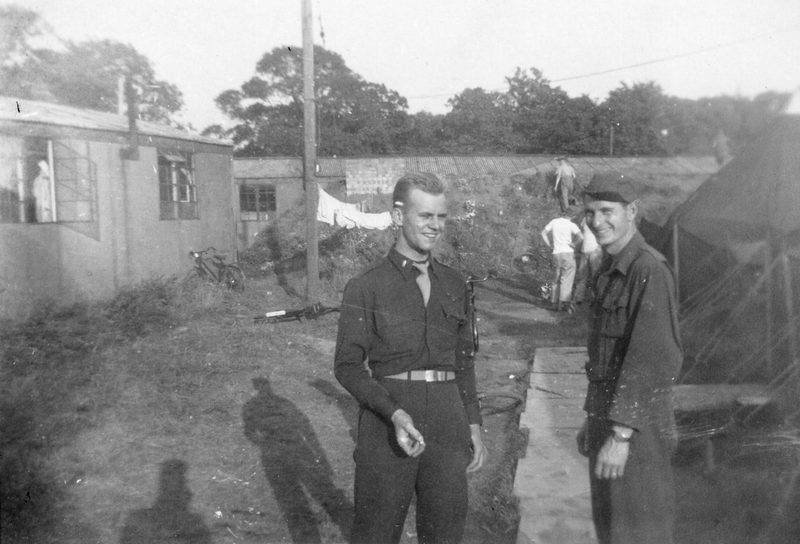 Remember the tents in the background of the photo of my dad and three of his crewmates at the beginning of this article? The tents in that photo look to be the same tents that Carl Guinn and John Bregant are standing in front of in this photo. Also, in both photos, Carl Guinn and Lenard Bryant are both wearing the same type of coveralls. Carl was the top turret gunner for the Norton crew, and after the Buslee crew’s top turret gunner, Clarence Seeley, was injured on the August 5, 1944 mission, Lenard, previously trained as a waist gunner, took over that position. I believe it was Carl who gave Lenard some pointers as to what tasks a B-17 engineer/top turret gunner performed. Lenard attended radio school for a while during his training in the states, and was familiar with reading switches and settings, so probably was a quick study for the requirements of adapting to the position of engineer/top turret gunner for the Buslee crew. From his first mission on August 4 as a waist gunner, Lenard had only five days to figure out his new job as top turret gunner on the August 9 mission, not much time for any kind of formal training. 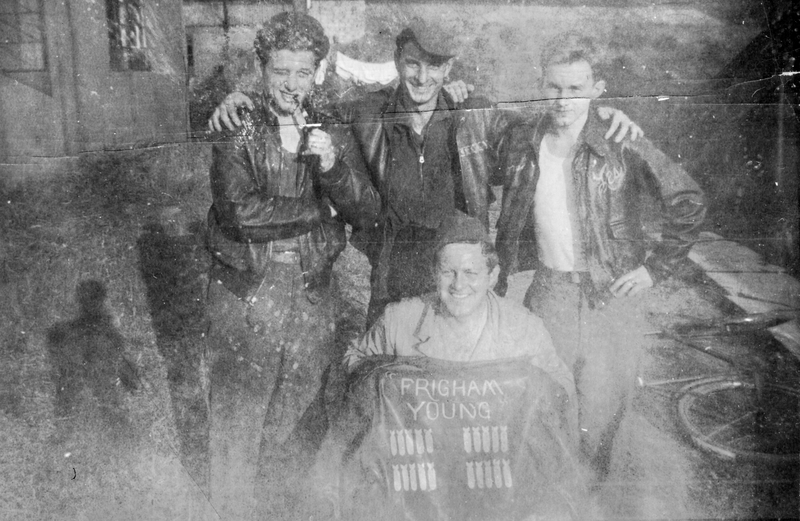 All members of the Frigham Young crew, including pilot Paul Norton, navigator John Lezenby, and original bombardier Hugh Green completed their tours with the 384th Bomb Group with the exception of one. Co-pilot Robert C. Barnes was killed while flying with a different crew on November 16, 1944. 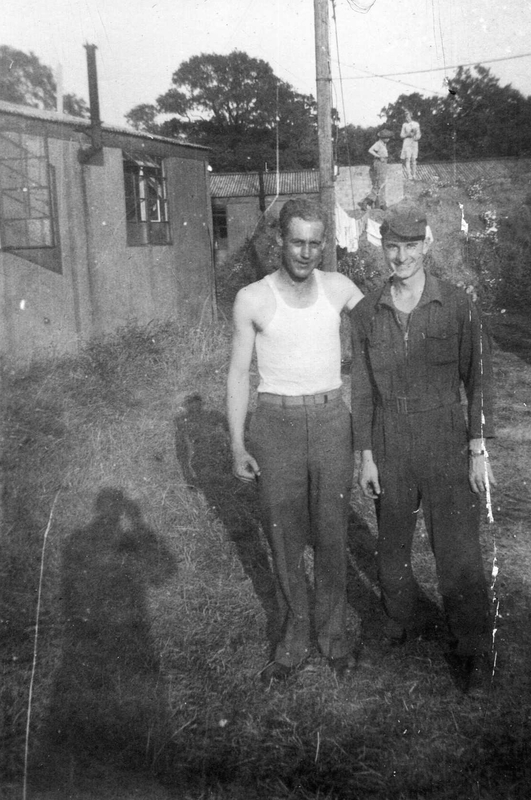 I must conclude, considering that my dad had these photos of the enlisted men of the Norton crew in his collection, that though most men didn’t make a lot of friends outside of their own crew, the enlisted men of the Buslee crew and Norton crew must have been friends and may have even shared living quarters in the 544th Bomb Squadron enlisted housing. I’d even like to go a bit further in thinking that my dad, from Georgia, and Lenard, from Texas, took a liking to Carl because he was a fellow Southerner. Living so far from their families in America, hearing “y’all” from a fellow airman in England probably helped them feel at home. Wouldn’t our dads be amazed to know that their children had “met” through a Facebook group because of some long-forgotten photos saved from their time in WWII? Long after my dad, George Edwin Farrar, and Tracie and Debbie’s dad, Carl Guinn, served in that great war, we were able to find each other and make a new connection in the 384th Bomb Group NexGen family. By thearrowheadclub in 544th Bombardment Squadron (Heavy) on June 6, 2018 .